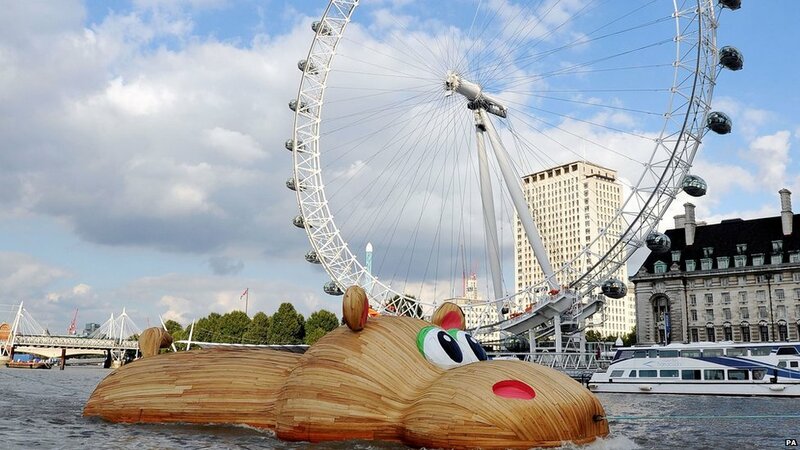 Giant wooden hippo swims down the River Thames! If you’ve been anywhere near the River Thames this week, you may have questioned whether you were going a little bit crazy! That’s because you may have seen a giant hippo bopping along in the water! Don’t worry though, it’s not an escaped animal from London Zoo – this one’s made entirely of wood! HippopoThames is an enormous sculpture created by artist Florentijn Hofman for… well, just for fun really! It started its river journey at its birthplace, the Royal Docks, and was towed past Big Ben, the London Eye and The O2! Hippopo even got to float underneath Tower Bridge and the Millennium Bridge! We think it’s probably the first hippopotamus the Thames has seen since dinosaur times!